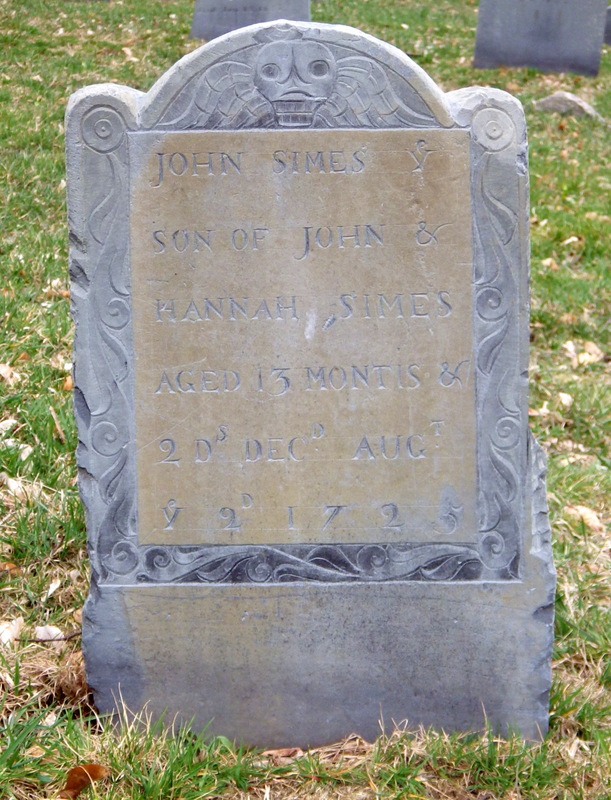 John Simes was born to John and Hannah Simes in 1724. He was Christened July 19, 1724. He died August 2, 1725 at the age of 13 months and 2 days. The ‘1’ that was transcribed in the early 1900 survey of the cemetery is actually the letter ‘t’, as can be seen in the current pictures of the stone.  It represents a shortened version of ‘August’. 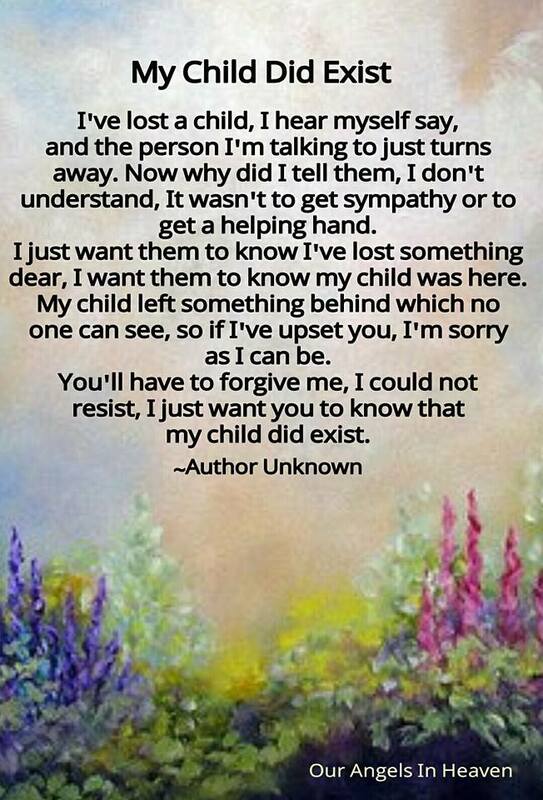 I cannot find what caused John’s death. In fact, I could find no [Simes, Symes, Symmes] lineage online that includes him. He has been forgotten. 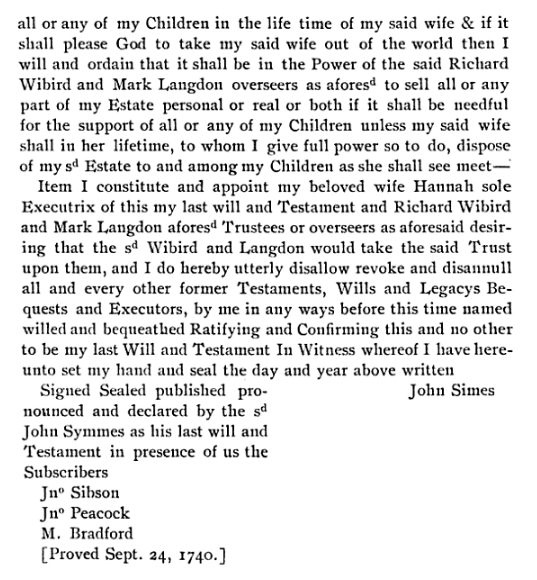 John Simes [the elder] was born 1700 in Exborn, England. His last name was spelled ‘Symmes’ or ‘Symes’. ‘Simes’ is the Americanized version. 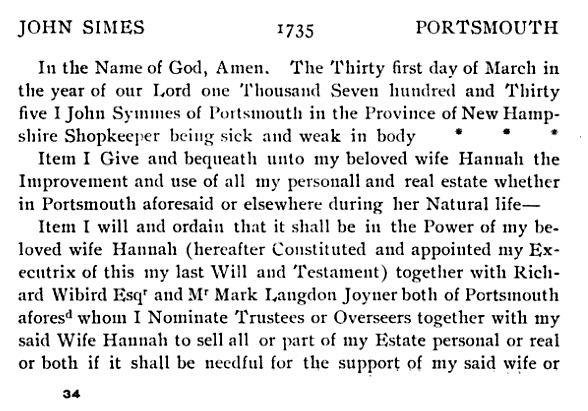 John married Hannah Jackson in Portsmouth, New Hampshire on October 22, 1718. Hannah was born in 1701 to Benjamin Jackson (1672-1710 ) and Mary Ball Jackson (1680-1740). 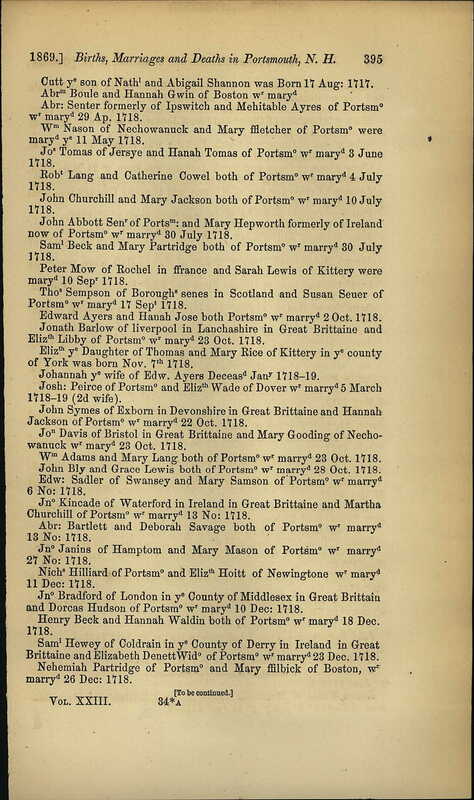 Mary… Born 1721 in Portsmouth, New Hampshire. 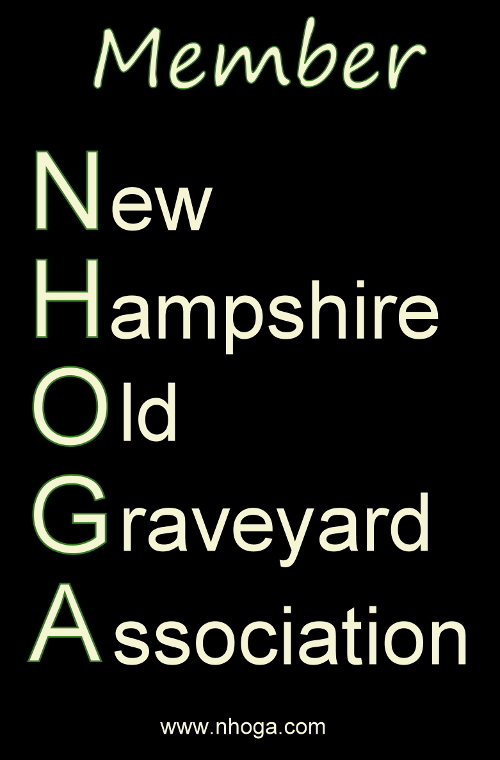 Died July 11, 1750 in New Hampshire. Married Jeremiah Libbey. Ann… Born October 20, 1727 in Portsmouth, New Hampshire. Died August 11, 1793 in Newington, New Hampshire. Married John Nutter. Hannah… Born August 14, 1732 in Portsmouth, New Hampshire. Died August 23, 1798 in Portsmouth, New Hampshire. Married Moses Noble Jr. According to John Simes’ Will, he was a shopkeeper. The Will was written in 1735 and proved September 24, 1740. 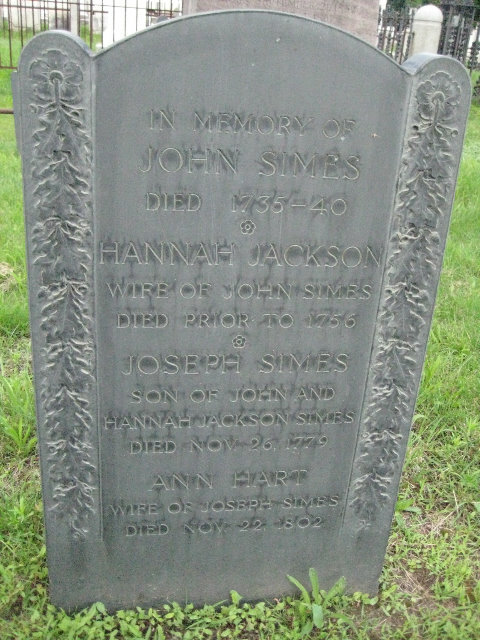 Hannah Jackson Simes died 1753. A memorial stone for John , Hannah, [son and wife] Joseph and Ann can be found in Proprietors Burying Ground, Portsmouth, New Hampshire. It was obviously placed long after John and Hannah’s deaths and the dates inscribed are approximate. There is a very nice recollection of the John Simes family written by Charles W. Brewster in Rambles of Portsmouth, second series. Unfortunately, Mr. Brewster didn’t have the advantage of the internet, Google searches, and the various Ancestry websites available to him at the time he wrote his articles. Mr. Brewster combined 1st, 2nd, and 3rd generations as though they were all originally of Patriarch, John Simes. 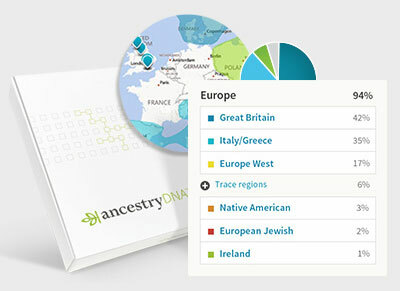 It is still useful reading for genealogy, but one must be cautious and vet the information.